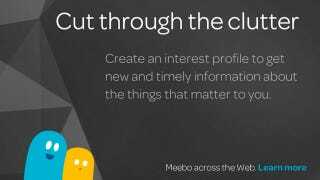 Meebo, onetime mobile chat king and current internet uglifier, has agreed to be acquired by Google. Details are sparse right now, but the purchase would make sense if Google's after Meebo as an ad platform. We are always looking for better ways to help users share content and connect with others across the web, just as they do in real life. With the Meebo team's expertise in social publisher tools, we believe they will be a great fit with the Google+ team. We look forward to closing the transaction and working with the Meebo team to create more ways for users to engage online." So what does that actually mean for Google+ users, and web users in general? Not necessarily that Google's going to stick a garish black bar at the bottom of your screen—though we've seen that it's fine with pinning one to the top of your browser. More likely it's going to be using Meebo's technology to share and distribute content over Google+, and perhaps integrating its other products into other social media platforms. Or it could be a push into social advertising. We'll update as we know about Google's intentions here. People can find content just fine. We use Google. What is not needed is another intrusive advertising element that spams itself into said content like an infestation of cockroaches. What an awful business to be in. Zuzax, very feisty. My hypothesis is that Google is great for straightforward discovery, but social media + recommendations tech can fill in the gaps. The technology is newer, but once we (and others) crack the code on user value, it will be less cockroach-y, and more awesome-y. More to come. We really appreciate the feedback. One somber note about the, acquisition, though is despite the cheery atmosphere to the Meebo blog post, the company reportedly laid off almost all of its employees today, just before the announcement.